I'm a photographic fine artist , specialising in still life. My work has shown worldwide, with limited edition prints available through my studio, galleries, and art fairs like Photo London and Paris Photo. Primarily art, architecture and sculpture. Old cameras fascinate me. I bought a vintage Mamiya from Sendean Cameras on St Cross Street, Hatton Garden. I like it's honest mechanics. A bit like my bike - they can always be mended. 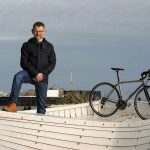 I actually bought my first serious bike from Velorution back in 2008. It was from Finland - a Jopo. Recently I couldn't resist a 1970's Raleigh Stowaway. I put a vintage french fisherman's creel basket on the front - for stashing my cameras. It's a Moulton TSR. I think my love of architecture influenced this purchase. The frames's structure is so sculptural. And it has that in-built iconic status. A classic. My eye is always finding interesting details - either architectural or natural. So the bike allows me to easily stop, take photos en route, and then continue on my journey. You go at your own pace. This opens my mind. London really is a great city to take-in by bike. I visit my studio in Clerkenwell, London, most week days, i'm usually walking my two dogs - Marcel and Milli - in the morning. So the roads tend to be quieter when i later head in from north London. Weekends I go to Harringay Local Store. What is your favourite route or destination? This entry was posted in Velorutionaries on 20th April 2017 by h l.
I’m a Property Underwriter at Lloyd’s of London specialising in US markets. Food! I love it! Primarily eating. That pushed my enthusiasm to cook it properly, conjuring up meals for friends is always a joy. London has a multi- cultural outlook on food, whether it be fine dining, or the plethora of pop-up street chefs serving new creations. Thankfully regular cycling helps mitigate any side effects from overindulging. I’ve been cycling for as long as I can remember, and can still picture my first Raleigh mountain bike. I took up cycling again to commute to work. I caught the bug quickly and now every summer I take part in a mountainous European tour with a group of hardy friends. Summer 2016 was in Vuelta, Northern Spain, which included Alto de L’Angliru. This bike is “Shinie Tempah”. A silly consequence of giving my bikes rappers’ names. 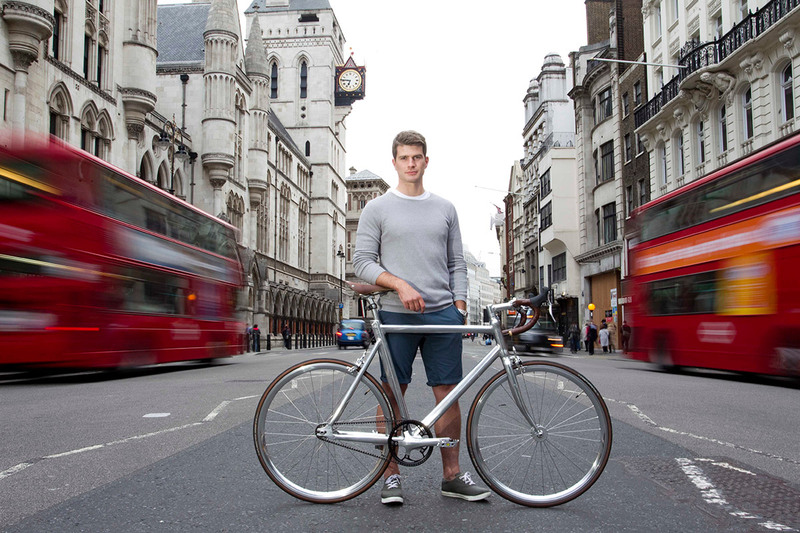 He is a Schindelhauer Siegfried Road, that has been beautifully modi ed by the team at Velorution. Brooks very kindly made a one-o saddle that matches the tan leather bar- tape and tyre trim, following a wonderful polishing job, it’s super shiny! I cannot speak highly enough about the belt drive experience. I love the freedom. There’s so little stopping time and you can travel as far as you want. I see a lot of riders cycling with earphones listening to music, whilst I can understand the appeal, I also love the peacefulness of a bike ride. Whatever the weather, I commute every day between the City and Battersea. I find it far more enjoyable than the packed Tube, it certainly wakes you up in the morning. I also try and do a fortnightly escapade to the Surrey Hills or around Richmond Park. My journey home from work is one of the best city commutes in the world. Down the Embankment, past The Eye, Big Ben, Westminster Abbey, across Chelsea Bridge and through Battersea Park. There’s so much history along the river. Other than that, a trail through Washington Park, Portland, and touristing Copenhagen. The best individual ride I’ve ever done was a twilight descent from Col De La Croix de Fer to Le Bourg d’Oisans. This entry was posted in Velorutionaries, Schindelhauer on 20th April 2017 by h l.
I’m co-owner of a fashion and beauty lifestyle brand communications consultancy ‘MODUS’ based in London. I work with British and international clients creating strategies to communicate their products and services. For me it’s about how we tell their story, through events like runway shows at Fashion Week, artist collaborations, photographic campaigns, seeing their clothes on musicians and actors, and creating content for their social media channels or websites. I’m passionate about design; as trustee of the Design Museum I’m excited about the move to its new home in South Kensington in November. I’m also on the board of the Victoria & Albert Museum, one of my favourite places to get lost, I always try and walk a different route, never knowing what I might find. I’ve recently rediscovered my love of ceramics and have been using a studio space in Mornington Crescent. I’ve been cycling since I was eight years old. My first bike was a Tomahawk, it was the little brother to the mighty Chopper. I’ve only recently started riding more frequently in the city. The ‘Boris Bikes’ got me riding to work. I was living near Hyde Park for a year and it was two miles to my office, mainly through the park. It’s such a great way to see the city. 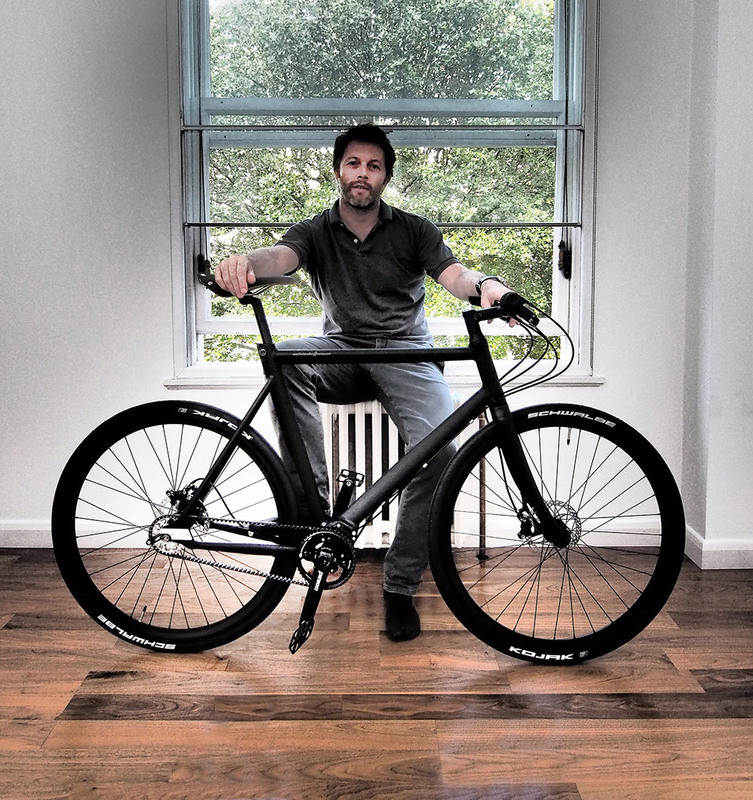 I’m riding a Biomega NYC with a lightweight aluminium frame, Gates Carbon Drive with an automatic two speed system. 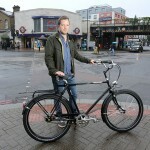 For me, it’s the perfect bike for London. a di erent perspective of the city. I can just stop and jump o my bike and really look at things. I live in Kings Cross, very close to my office. I only cycle to work in the summer. I cycle a lot at the weekends with my son. We live by Regents Canal. The route through Camden Lock, by London Zoo, seeing the giraffes on our way through, out to the Paddington Basin passing Little Venice, or up by Kings Cross. The destination is usually food related. Melrose & Morgan is just off the towpath before Regents Park and a perfect place to stop. of the camera with Warner Brothers, dancing amenco at Sadler’s Wells Theatre, modelling at the Royal Academy, and painting my own classic artwork for exhibitions. I o en sing classic jazz, with a long line of musicians in my family tree. six years ago a er a longstanding performance in Europe, without much driving experience. I decided to travel across London on a bicycle, reminding me of all my past travels and adventures in my early years. 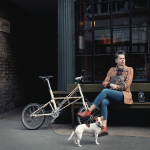 I ride my Brompton everywhere in London, it’s easy to fold the bike before entering shops, restaurants and my own working areas, its size and shape are the size of a suitcase when folded. When riding, the upright position on saddle reminds me of riding horses. Through my international travels, I have seen the cycling life of grand cities like Bangkok, before becoming convinced that it’s the best way to keep your fitness and speed of travel on balance, without the barriers of traffic, cost of travel and an engine to look after. It was in London, at a red light, where a cyclist stopped next to me, looked down on his muscular legs and said, ‘These are my own powerful engines’. I have passions to perform on stage, my Spanish flamenco costume, stamping all the beats to Compás. I really enjoy cycling through London in my Old English suit. 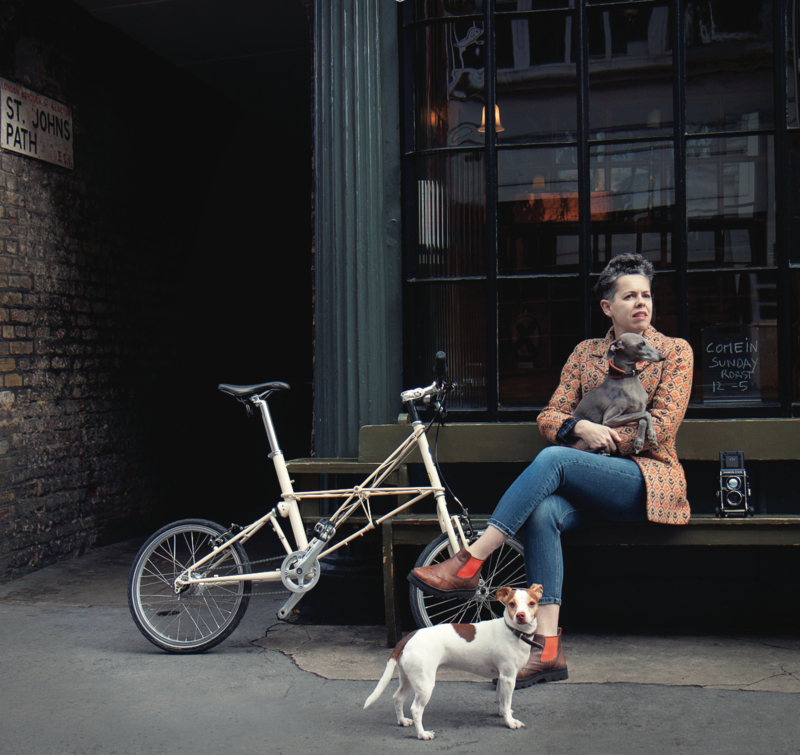 The waistcoat and jacket from Velorution’s No75 collection. Every day across London, to work and back. Through Hyde Park, Oxford Street, Kings Cross and the West End. I also ride the silent path of the north canals and Kew Gardens at the weekend. I stop at cafés and restaurants wherever I go. With my love for classic architecture, I enjoy riding through the colourful streets of Notting Hill, or the awakening workout when riding up to Harrow on the Hill on a sunny day. I run an independent dental surgery supply and maintenance company, and have done since 1988. I refurbished my home I spent a decent amount of time designing the kitchen space, choosing the most suitable and practical appliances to give me longevity. My other passion is music – I can’t play a note, but I have a somewhat eclectic taste, I’ll go see a band, a gig or an orchestra as often as possible. Brighton is blessed with numerous venues and a very vibrant music scene. I’ve been cycling recreationally for ages and completed a few duathlons and at least three London to Brighton rides in more recent years. A Dutch masterpiece that rolls along by the name of Van Nicholas. of fitness. The chance to go and explore the countryside and spaces that I would never otherwise go to, and to connect with nature. To see and smell the seasons as you ride through the country lanes and take in the view – more readily available in the slow lane than from the driving seat of any vehicle. To ride with others (my girlfriend is a keen cyclist) and chat as we pedal is also such fun. We share moments, smells, scenery, and the occasional pub garden. in the country, I hear) with my local tri club, or for a good long ride on a Sunday, around forty miles. The byways of East and West Sussex at the moment, but having not long returned from a cycling holiday on the island of Majorca, I must say, that’s really high up there, but not so readily accessible. 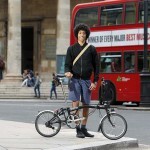 I am practising as an architect in London, designing homes for those who don't cycle! I don't remember a time I didn't cycle, stabilisers are still a memory. 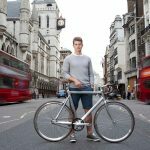 Having experienced competitive cycling in bmx, road racing and mountain biking, there is nothing more rewarding than cycling at your own steam. So what are you riding now? A bespoke Schindelhauer which I have de-badged and slicked. 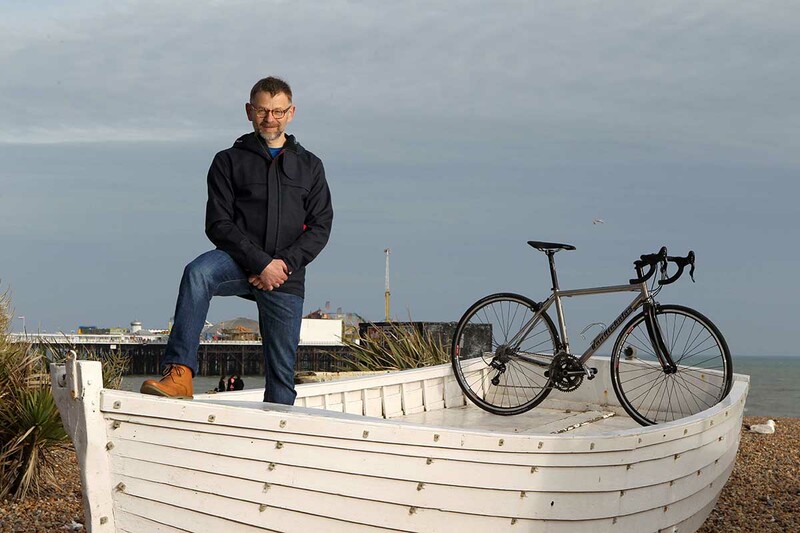 Having tested the ingenious engineering of the bike, mulling it over and creating a spec that will put a smile on my face each time I see and cycle it. The bike has massive amounts of control and solid sense from the tires through the frame and in to the saddle and bars. Not as often as I'd like. With my new bike things will change. What's your favourite route or destination? The one with least cars unless I am in a 'courier' mood which Schindelhauer is well equipped for! 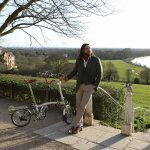 I’m a Sales Account Manager for Brompton Bicycle. I’m responsible for developing B2B relationships, coming up with sales strategies and training dealers. It’s an interesting role with a good balance of being in the office and out on the road. Of course, I love all things cycling. I also have a passion for listening to, and making music. I’ve always had an eclectic taste, from baroque to big band, delta blues to death metal and most things in between. At the moment I’m playing the harmonica, piano and guitar, but I also have some more niche items in my collection such as a bamboo saxophone, dobro and ocarina. Unfortunately I’m not allowed bagpipes. From three years old, I’ve always had some form of wheels. My first ‘proper’ bike was a lovely green Raleigh with stabilisers. 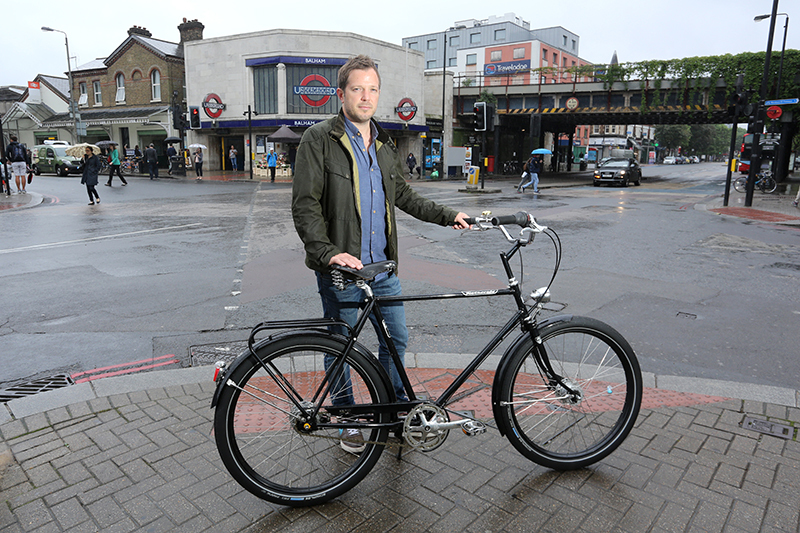 I started commuting eight miles a day to school from Stoke Newington to Islington with my Mum aged seven. I have fond memories of riding along the canal reciting my times tables. Weekends were spent cycling towards green spaces with my parents. By eleven I had already completed my first forty-mile charity ride, I haven’t stopped riding since. My Brompton! It’s probably the best purchase I’ve made. 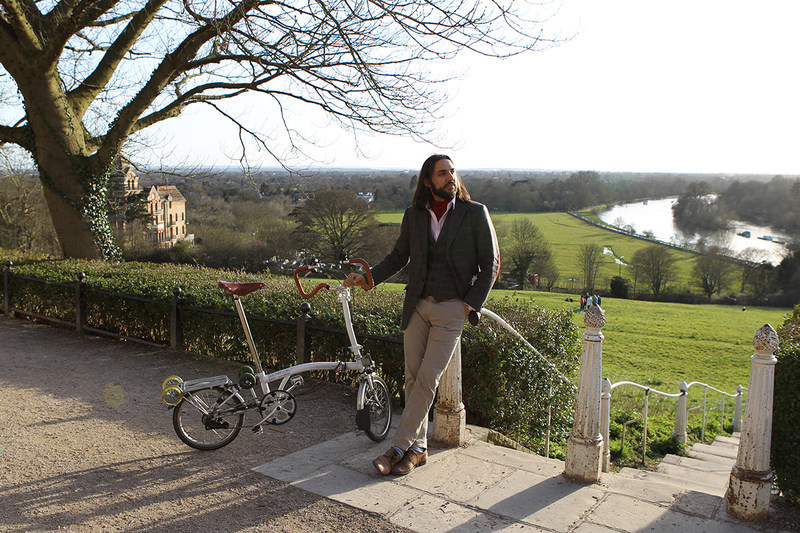 I have bikes for most disciplines, but the Brompton trumps them all. I’ve locked it up twice in five years. It’s always by my side or in the cloakroom, whether I’m out on the weekend, shopping or at a gig. The freedom to explore, the sense of community, the satisfaction gained from reaching a destination through my own efforts. There are so many benefits to mention before even touching the health and environmental factors. I ride to work pretty much every day and try my best to get out on the weekends. A group from the Brompton factory ride the London to Brighton every year and the Surrey 100 on our Bromptons. 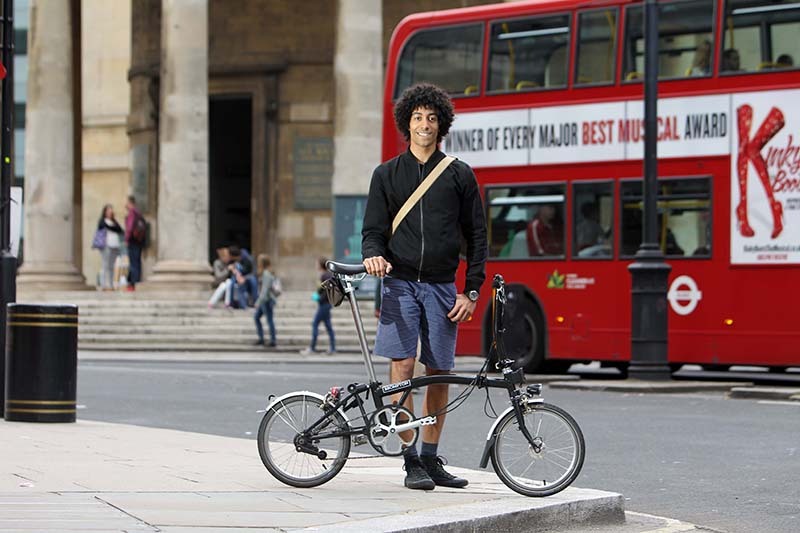 I also take part in The London Nocturne folding bike races and the Brompton World Championships, representing the Brompton Factory Racing team. Probably the Ronde Van Vlaanderen route. It’s gruelling work and a real test for your equipment, fitness and mental fortitude, but it’s a ride steeped in cycling history – a true classic. For destination, it’s anywhere with good cake. This entry was posted in Velorutionaries on 5th April 2017 by Damian Sell. I’m head of Digital for Universal Strategic Marketing International based in London working with some of the world’s greatest music artists and their catalogues. My role involves working with our many stakeholder teams across the globe in delivering new releases and content to our fans through a multitude of channels and digital initiatives. I’m also the project lead for udiscovermusic.com Universal Music’s new global music discovery and editorial platform. 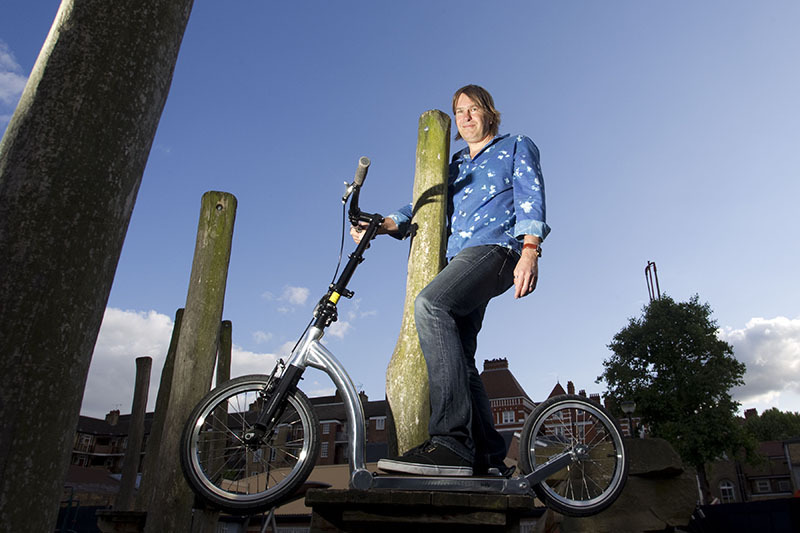 Music, film, scooting, cycling, travel and tech innovation. All my life. I learned to cycle at a very young age and always loved it. I now ha e the new MK3 Swifty folding scooter that I use daily plus a Marin bike that I use for longer rides. I bought the Swifty folding scooter last year and it totally changed my daily commute. 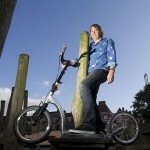 What appeals to you about cycling and scooting? I love scooting across London as it gives me time to think about the many creative aspects of my job. I find it relaxing and good to relieve stress at the end of each day. Scooting is a great way to escape the full train commute, as I can jump out at Clapham junction and scoot the last few miles home. Most weekdays unless the weather is really bad. 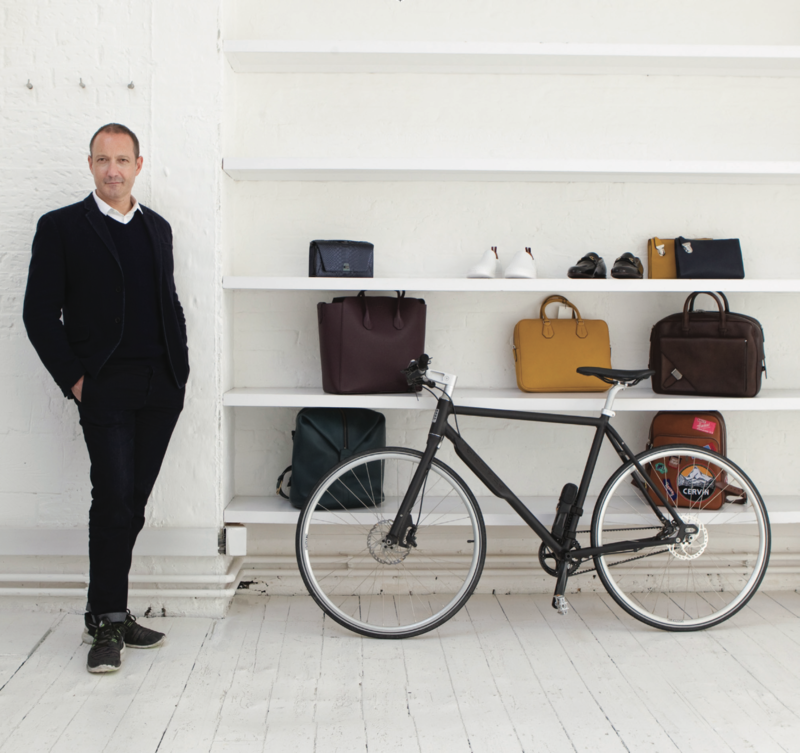 Having the Swifty means I can fold it and take it on the tube, train or to my meetings in town – it’s light and super easy to fold, so for my needs it’s the ultimate urban form of non-motorised transport. Weekdays are great as most of my journey is on road or cycle paths. At weekends during the summer I try to go for a longer rides to Richmond Park or along the Thames. I’m Vice President of Hotel Acquisitions at Starwood Capital Group. My family and friends. I’m fortunate that I get to see places through my job and really enjoy world travel. I’m also really keen on outdoor sports. Food and wine are also one of my passions. Since my childhood, I picked up mountain biking when living in Arizona during my University years and then later I enjoyed cruiser biking when I lived in California and Amsterdam. 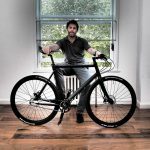 I recently bought a handmade Retrovelo it’s the Rolls Royce of bikes, classic engineering, retro design and a modern drive, it’s like riding on air. Relaxation when riding a bike outdoors, getting some exercise and chilling out. Cycling is a great way for me to take a break from the hectic and busy lifestyle in London. I try to cycle every weekend in the wonderful London parks and around town during the day. Sometimes in the summer evenings it’s fun to hop between pubs with friends. Along the Thames river paths, out towards Richmond, still connected to the city but far enough away to find some space.